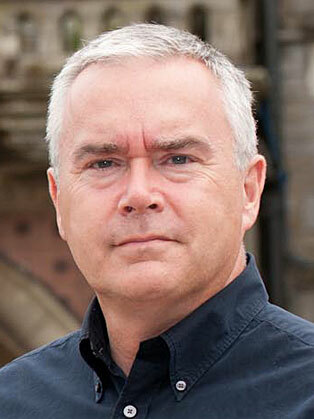 Huw Edwards is a Welsh newsreader and journalist. Huw Edwards is a Welsh journalist, presenter and newsreader and has presented coverage of major national events such as the 2012 Olympic Games. Huw Edwards anchors Britain's most popular TV news bulletin, BBC’s Ten O'Clock News. He also led the commentary of the spectacular opening ceremony at the London Olympics, watched by a record 27 million viewers in the UK alone. Originally a Parliamentary Correspondent, Huw has since won a BAFTA award, made a cameo appearance in the Bond movie Skyfall and commentated on Barack Obama’s inauguration from a Washington rooftop. He has interviewed Presidents, Prime Ministers and major figures in all areas of public life. Huw combines newsroom duties with presenting major state events, from Trooping the Colour to The Queen’s Diamond Jubilee. He has filmed The History of Wales and made documentaries on Gladstone and Mozart, among many others, and regularly visits schools as ambassador for BBC News School Report. Huw has a natural warmth and authority as an awards host and conference chair. He is also a gifted raconteur with a ready wit, as demonstrated in the panel game Would I Lie To You? The conference would not have run as smoothly without Huw’s professionalism and energy as chair. He is the best there is. As usual Huw was a star and ran the conference perfectly.